09-Apr-2004 -- The 25°S 48°W confluence is the southernmost of the state of São Paulo and is located in a World Heritage Site as an environment protection area. The only way to reach the confluence is by boat. My son Nicolas and me decided to visit it with our 35-year-old selfbuilt wooden sailing boat JACARÉ II. Thursday morning we left Cotia- SP, and arrived in Porto Cubatão three hours later. We launched the boat at 14:30 PM but strong tidal currents and light wind hinderd us to progress toward the confluence, 12 km ahead. Therefore we decided to return to the marina and start the next day morning. So we did. The confluence is located in the Cananéia estuary which has a mixture of salt and sweet waters and is subject to tides. The confluence is located on a small mangrove island (no name), at the river Itapitanguí, 1 km from the mouth. The river is 300 m broad at the confluence site but only 8 km long. We hit some sand and mud banks before arriving to our destiny and found out that the confluence is located in the mangroves, (trees which grow on mud), 95 meters away fom the shoreline. It is difficult to go through the mangrove mud. We took the N, E, S and W pictures from the shore, instead from the confuence, inside the mangroves, because we probably would not get the GPS satellite signal. We would see only mangroves all around at the exact site of the confluence. The sight to the water is more delightful, of course. After half an hour we headed back to the marina. Only 300 m from the confuence we saw three dolfins (Sotalia guaianensis) just 15 m from our boat. At afternoon we left the coast, back home, at time to commemorate my wife´s birthday. Economically the region is considered one of the poorest in the state of São Paulo and is inhabited mainly by traditional rural communities and fishermen (caiçaras). The site belongs to the Estuarine Lagoon Complex of Iguape-Cananéira-Paranaguá. There is also a great extension of beaches showing a succession of opened ocean-sand dunes-sandy strings. The centre of the Estuary is the region of Cananéia. These lands are separated from the ocean by an sandy archipelago that runs parallel to the shoreline and comprises the islands of Comprida, Cananéia, Cardoso, Superagüi, Laranjeiras, Peças and Mel. The main town in the region is Cananéia, with about 10000 inhabitants, one of the oldest in Brazil. Economy is based on tourism and ocean fishing. Cananéia is an indian settlement dating before the time of European discoveries and often considered as the starting place of the Peabiru Trail or way, which served the Inca empire in pre-Colombian times, linking the Atlantic to the Pacific! Near the mouth of the Itapitanguí river we can see a “sambaqui” (pron. Samba-key). 6.000 years ago, many people begun to live on the Brazilian shore. They lived there based on fishing and collecting moluscles, beyond hunting and catching of plants too. The word "sambaqui" is an aboriginal word, on tupy language. It means "mussel mountain". Putting together all the rinds and shells they got, these ancient groups build up incredible mountains that are near 15 meters height! Inside that, archeologists find many of their tools, fish-hooks, objects, a lot of burials and other things that explains a lot about how these people lived. More than 50 archaeological sites were unearthed in the area. In Brazil we have sambaquis all over the seashore, being the more ancient on Amazonas and the newest on Brazil´s south. They represent a work of many generations, and actually "sambaquis" are an important source for studying of mankind history. The area is also a centre of traditional knowledge on the forest and comprises an African “Quilombo” population, which still speaks Bantu language and preserves its ancestral uses and costumes. 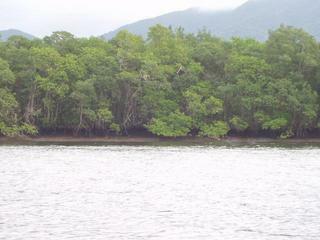 In the Environment Protection Area the forest around the mangroves is called Atlantic Rainforest. More than 450 species/ha can be found in some spots, which indicates that the diversity of woody plants in the region is larger than in the Amazon rainforest. Forest canopy along river valleys is taller, with isolated trees reaching up to 30m in height The region has sub-tropical humid climate. Average temperature in the hottest month is 22°C (February) and 18°C in the coldest (July). Average annual precipitation is 1,200-1,500mm. Rains are well distributed throughout the year and there is not a marked dry season. There is a highly diverse fauna with several species of conservation concern. Mammals include 120 species, probably the largest number in Brazil. Some noteworthy species are jaguar Panthera onca, ocelot Leopardus pardalis, bush dog Speothos venaticus La Plata otter Lutra longicaudis, alligators, 20 species of bats and various species of endangered primates. #1: Confluence located 90 m inside the mangroves.